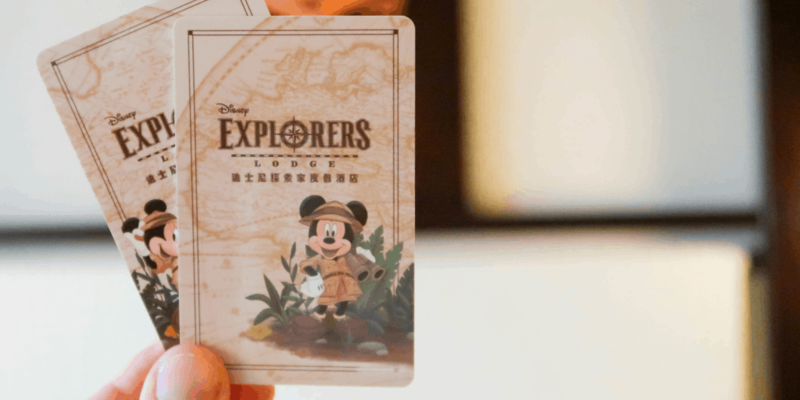 Disney Explorers Lodge is the newest hotel at Hong Kong Disneyland, which opened on April 30, 2017. 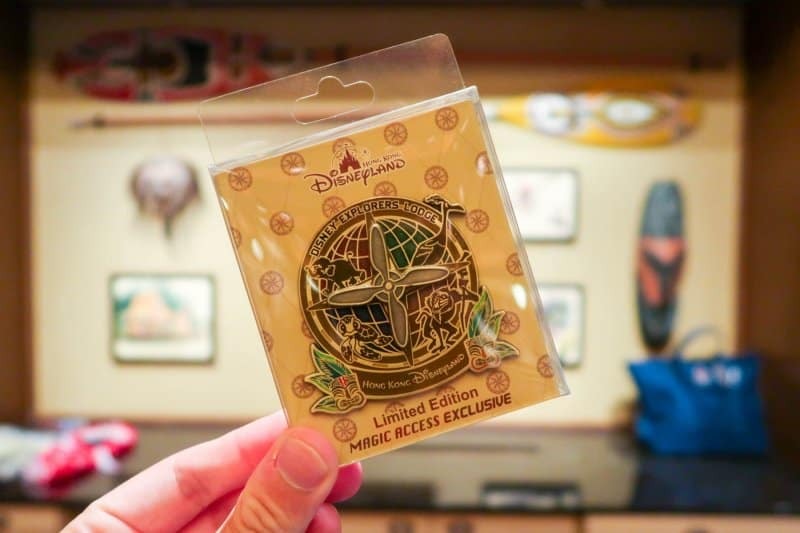 This is the third hotel option (Hong Kong Disneyland Hotel and Disney’s Hollywood Hotel being the others) and takes on the “exploration” theme, which is similar in style to the Disney’s Animal Kingdom Lodge at Walt Disney World Resort. 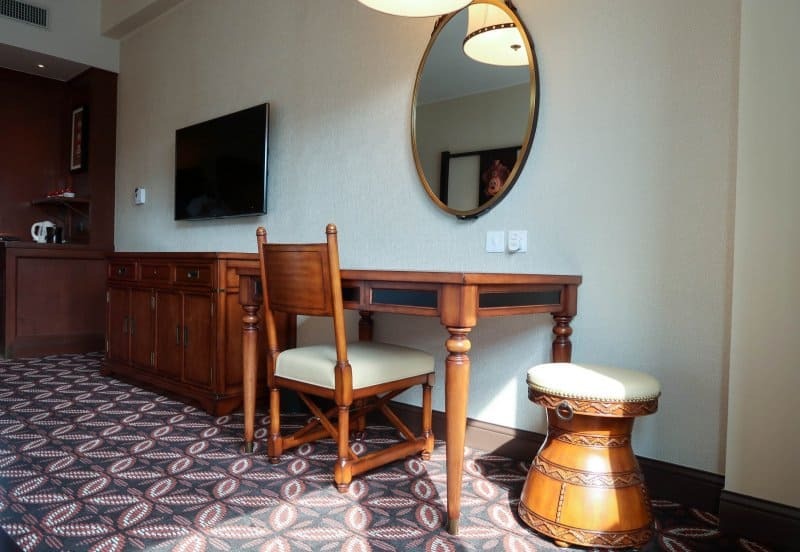 Our review covers various aspects of the hotel to help you decide if this hotel is right for you. Also, I couldn’t help but stay at a Disney Hotel with the word “Explorer” in it. Rooms start at HK$2,200 (~$285 USD) per night for the standard room (the first floor with 2 queens sized beds). Our room was the Deluxe Room, which starts at HK$2,300 (~$295 USD) per night. We are Magic Access Members, but since our stay was over the weekend, we weren’t eligible for any discounts. Check the official website for the latest rates. 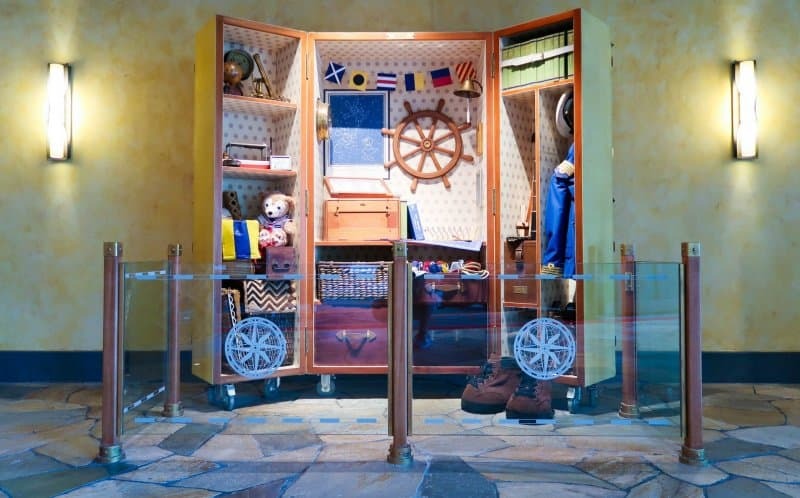 The Disney Explorers Lodge is split into four different themes: South America, Africa, Oceania, and Asia. 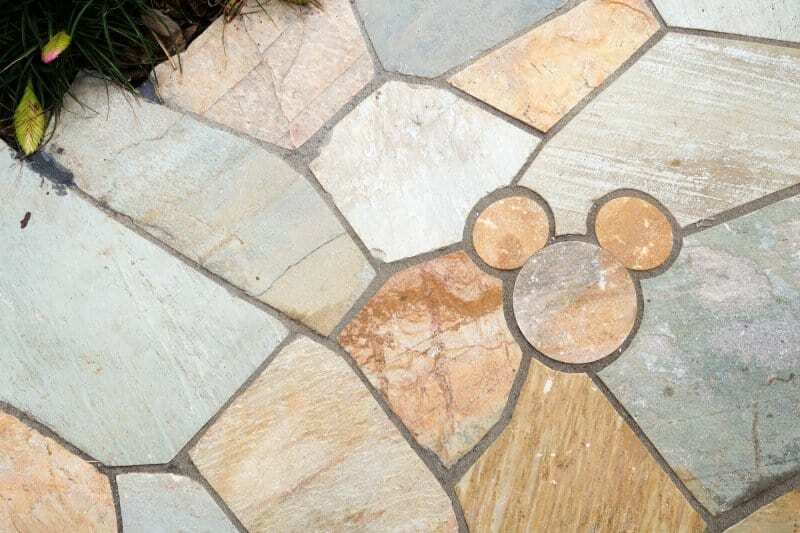 Disney films which fit the theme of the area can be seen in the details. 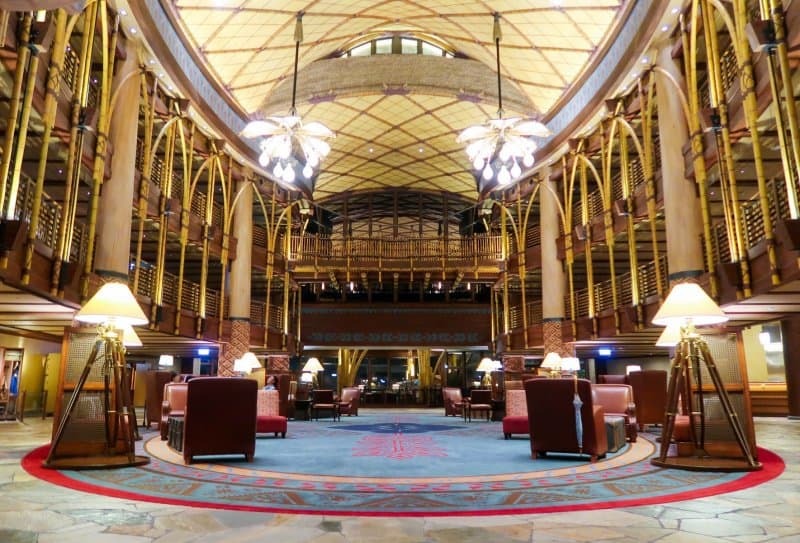 The main lobby has a gigantic open concept that is reminiscent of Disney’s Animal Kingdom Lodge and allows the sunlight to bask everyone relaxing in the area (plus, the carpet is so soft I want to walk on it barefoot). In the back is a wooden walkway to “bridge” the gap between two areas of the hotel (that pun was too easy to pass up). On the left of the main lobby are oversized suitcases which showcase what Mickey, Minnie, Donald, and Daisy pack when off on one of their adventures. I’ll allow the photos speak for themselves. 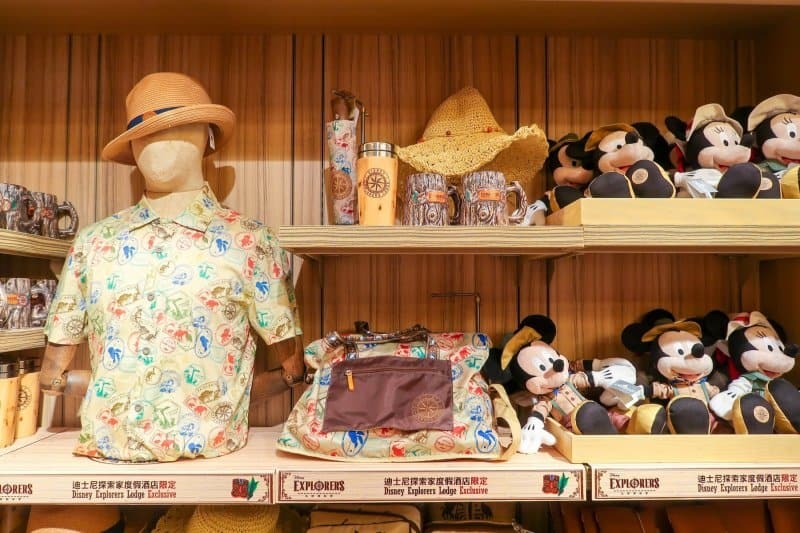 The main lobby is where you’ll also find the gift shop, The Trading Post, that carries a range of Hong Kong Disneyland items and exclusive Disney Explorers Lodge merchandise. 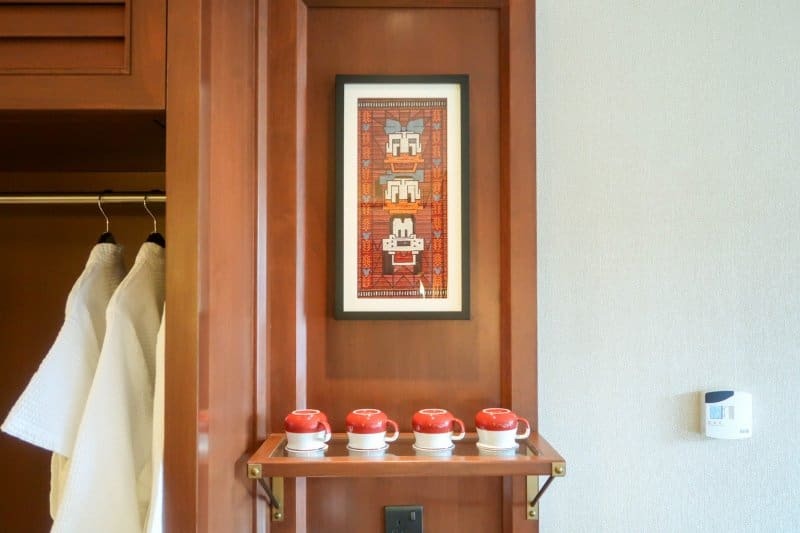 One of my favourite parts of the hotel is the hidden-in-plain-sight Mickey and Minnie. You’ll find them in two different rock formations on opposite ends of the hotel. At first, you’ll think they are random rocks that serve no purpose. But if you position yourself just right, you’ll reveal the silhouettes of either Mickey or Minnie. Let’s talk about the hallway and the elevator. I love the attention to detail here. Our room was in the South America section. 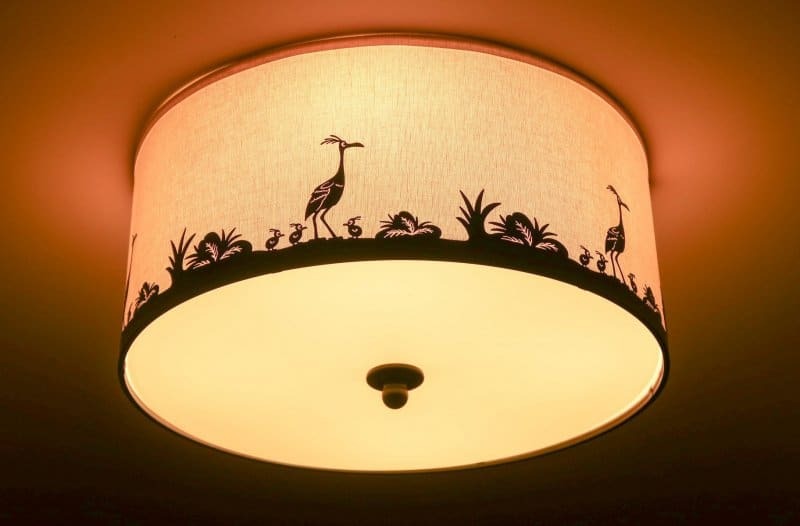 The elevator looks like a hot air balloon with all the dials and pressure gauges inside, while the light fixtures hanging from the ceiling have a silhouette of Kevin (you know, the bird from Disney Pixar’s Up). 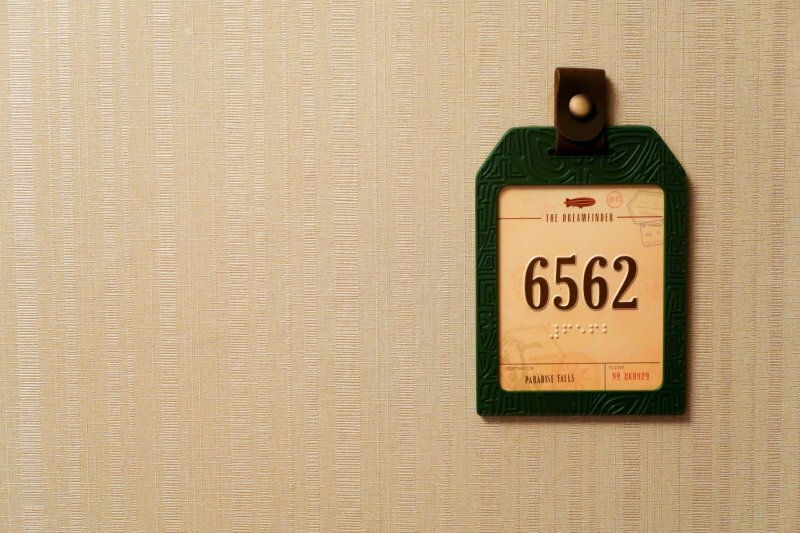 Along the walls, the light fixtures are binoculars and the room number plate on the wall is a luggage tag that says “Paradise Falls.” The other sections of the hotel have the same type of decor, but the details reflect the theme. We had the Deluxe Room on the 5th floor in the South America section of the hotel, with a view of the pool area. The first thing you’ll notice about the room is the ample space you have. The bathroom sink is separate from the toilet and shower room, which gives it a feeling of space. If you have 4 people staying in the room, space shouldn’t be a concern. There’s tons of room to put your luggage, and there’s even space under the bed. While the Disney theme isn’t abundant, that isn’t a bad thing. 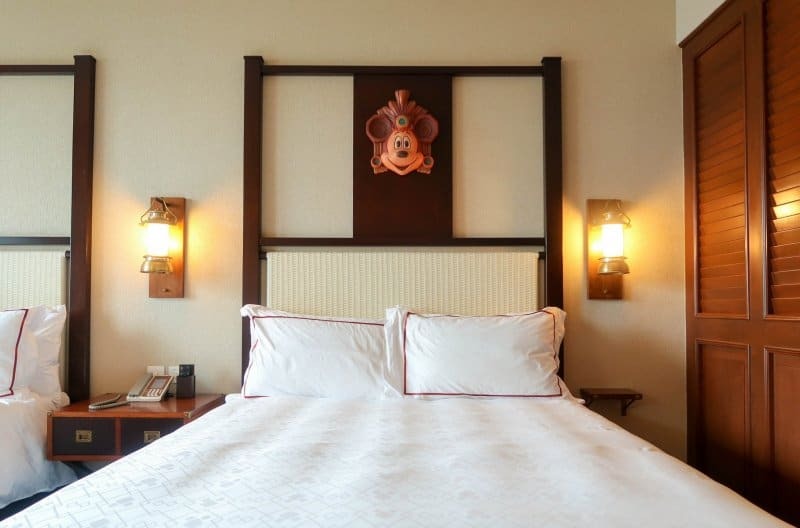 Above the two queen-sized beds are carvings of both Mickey and Minnie. 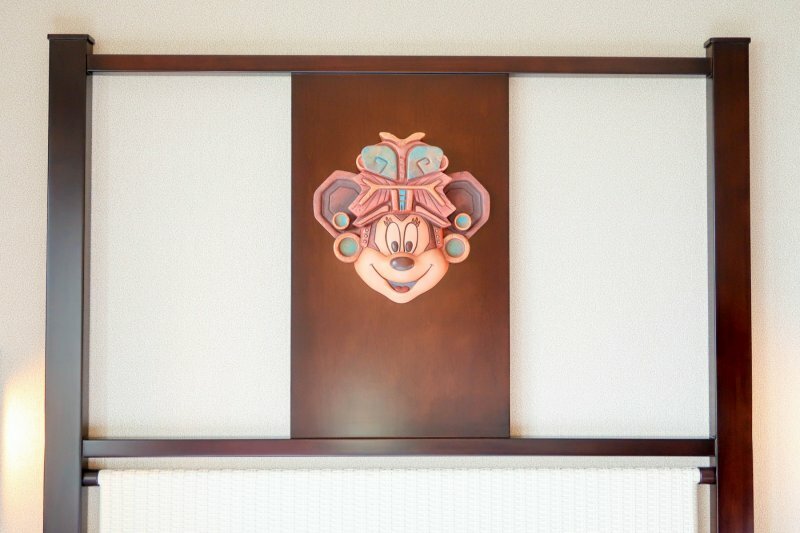 Above the mini bar is a portrait of Donald, Daisy, and Goofy. Of course, you can’t forget the amenities kit in the bathroom. That’s the extent of the obvious Disney theme in the room. I am a huge fan of minimalism, so this is right up my alley. The washroom has a standard toilet and a standing shower (there are no bathtubs in any of the rooms). I am not one to take a bath while on vacation, so having just the shower is okay with me. If I want to submerge myself in water, I’ll just head down to the pool area. 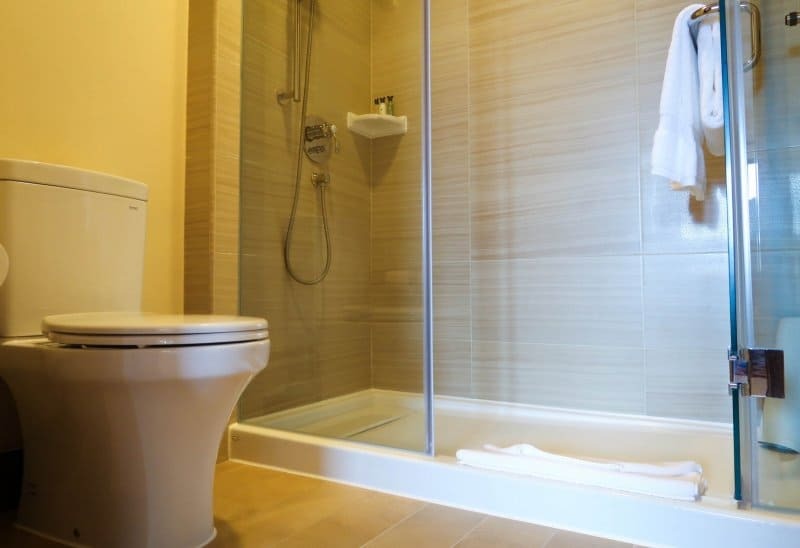 The sink area has ample space for all your toiletries, and don’t forget to take that awesome amenities kit! It has the standard items in there, such as Q-tips, cotton swabs, nail file, and even has a small sewing kit. 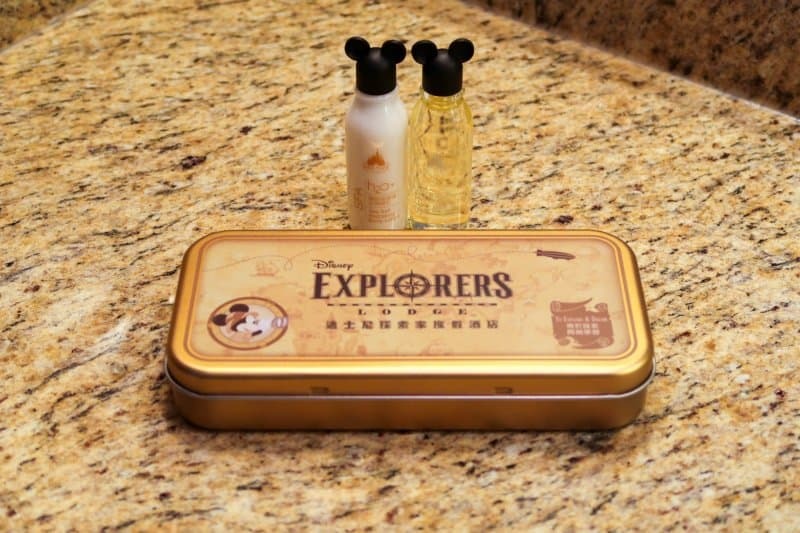 The body wash and shampoo are the same ones they use at the Hong Kong Disneyland Hotel. If you’ve stayed at a Tokyo Disney Hotel, then you’ll know from experience that their beds are comfortable but rather firm. The beds here are not as firm and are some of the most comfortable I have slept in. My preference is a firm bed, so this was perfect. 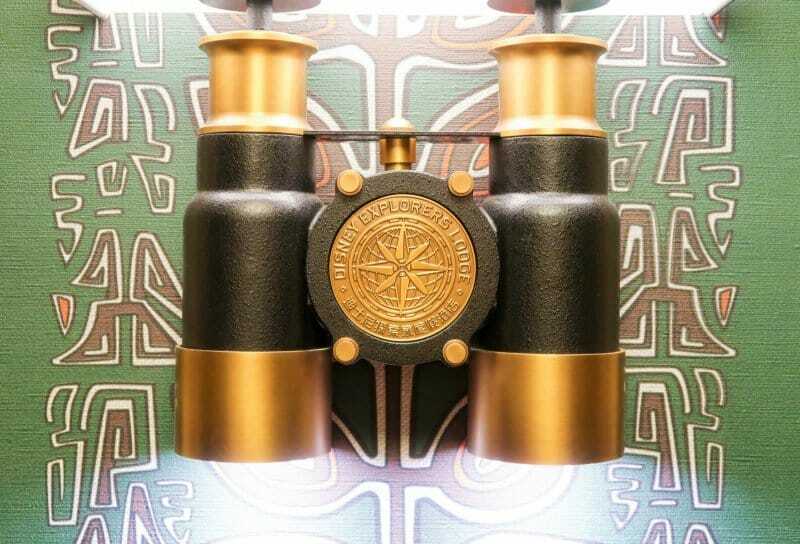 One detail I didn’t notice right away was the leather belt that wraps the mirror on the wall and the compass at the top of the mirror. It’s always a joy when you find something afterward. As mentioned before, our room had a view of the pool, which also means you are able to see the South China Sea. You can’t go wrong with a view of any body of water. Pay attention to the pool area, as sometimes you’ll see the characters out there mid-day roaming about! Watch our full room tour below to get a feel for what I described above. There isn’t much outside of the Disney hotels in the immediate area (besides walking to the park and the other two hotels), so having a choice between four beautiful gardens gives you enough to walk around in. Find a nice quiet bench, relax, and gaze over the South China Sea. Or if you wear glasses like myself or tote around a camera, there are enough walkways between the gardens to allow sufficient time for your glasses or lenses to defog from the summer humidity. Rain Drop Pool is a large swimming pool that became one of my favourite parts of the hotel. On average, the number of times I use a hotel pool is zero. Even though I am a huge fan of swimming, I just never make the time for it. 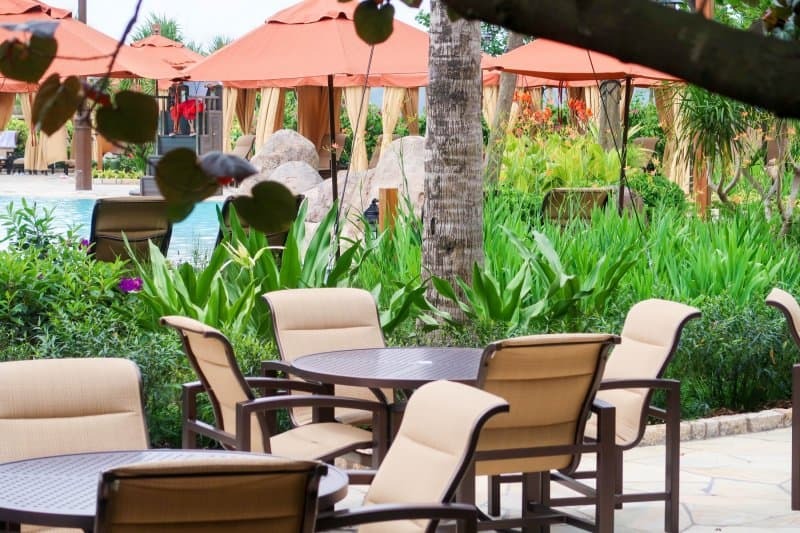 While the pool is basic (as in there is no water slide), it fits the theme of the hotel and the pool area has lounging chairs both in the sun and under cabanas. During mid-day, characters come out and greet you, too! While we were there, we saw Goofy. Since Hong Kong Disneyland tends to open later and close early most days (check their schedule), the pool is open before and after park hours. Which means there is no excuse to not use the pool! Unless you forgot your swimwear (which I thought the gift shop would carry, but I only saw outfits for children). Overall, the pool is the perfect way to relax after a hot and humid day at the park or a beautiful way to start off the day. Slap on some sunscreen and head on down to work on your tan (try not to burn, ’cause that’s not fun!) Keep in mind the pool is closed in the winter, so you’ll want to check if it’s open or not. 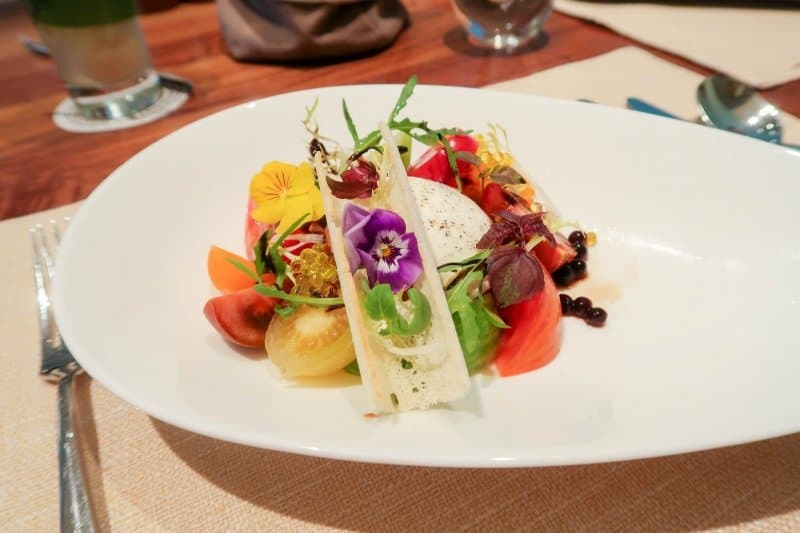 You have three choices for places to eat, all of which cover the spectrum of restaurant options: character dining (buffet), casual dining, and table service. All the restaurants are on the first floor of the hotel, which makes it easy to take a gander at the menus and figure out what tickles your fancy. 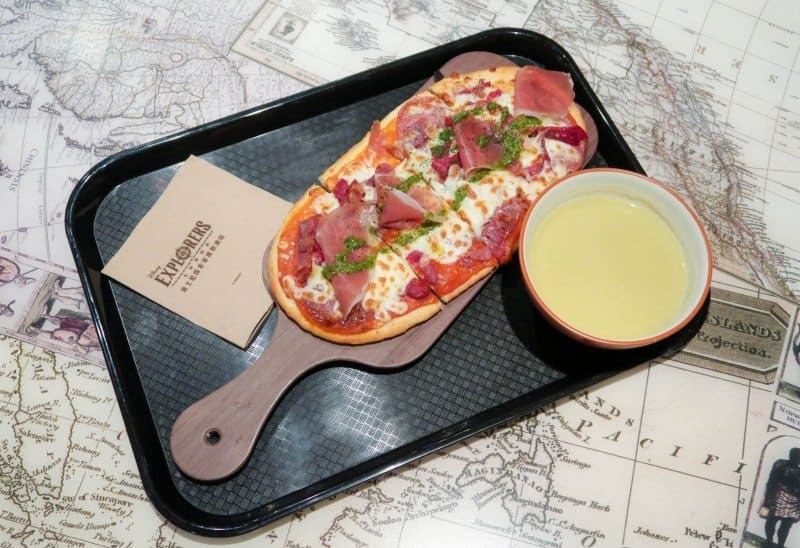 This is their casual dining option that offers pizza, vegetarian options, sandwiches, bottled drinks, and exclusive desserts. A meal starts at HK$99 (~$13 USD). We ate here for both breakfast and dinner. The pizza and Mickey waffles are superb. It’s a bit on the expensive side, but this is your cheapest option at the hotel. 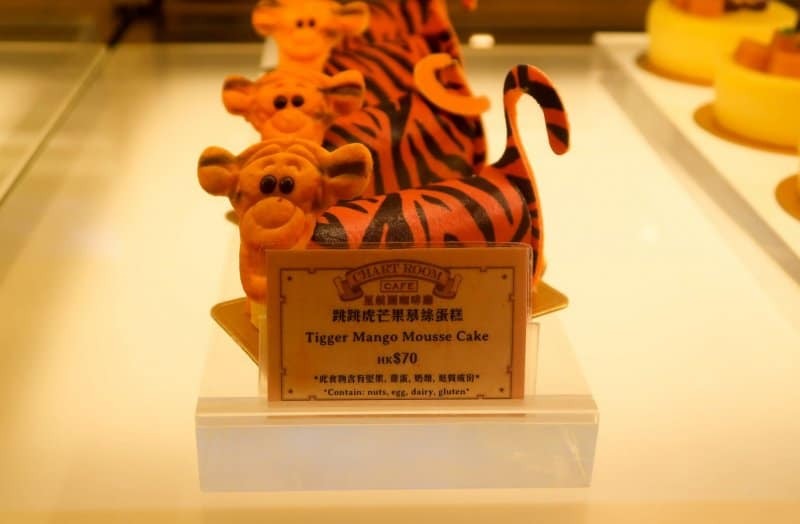 This was one of the best meals we’ve had at Hong Kong Disneyland. They offer a large selection of cuisine from Western to Asian to vegetarian. Meals start at about HK$200 (~$26 USD). 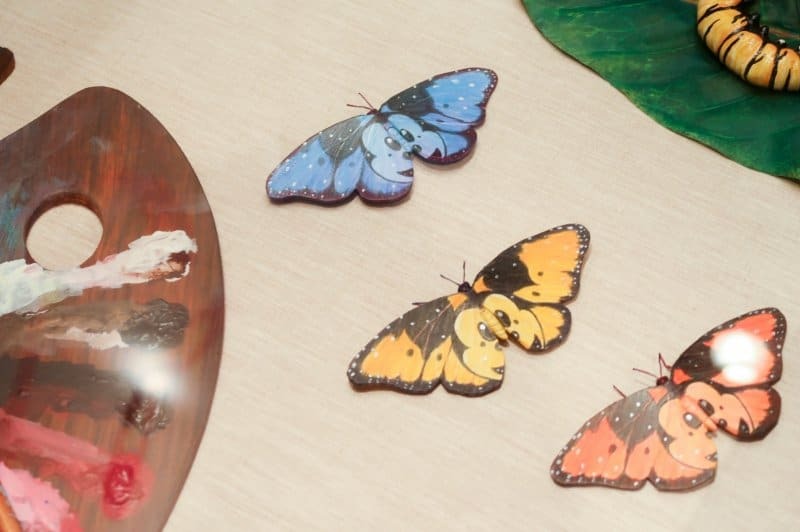 The decor inside is beautiful, but it doesn’t have that “exploration” aesthetic and atmosphere that matches the rest of the hotel (except the cute display of insects with Disney paintings on them). It feels as if it could fit into any other hotel or upscale mall. With that said, if that’s the only downside, then I think they did an excellent job. We didn’t need a reservation, but if you want to guarantee a time slot, if you’re a hotel guest you may email to make a reservation. If you’re not a guest, then you’ll have to phone. 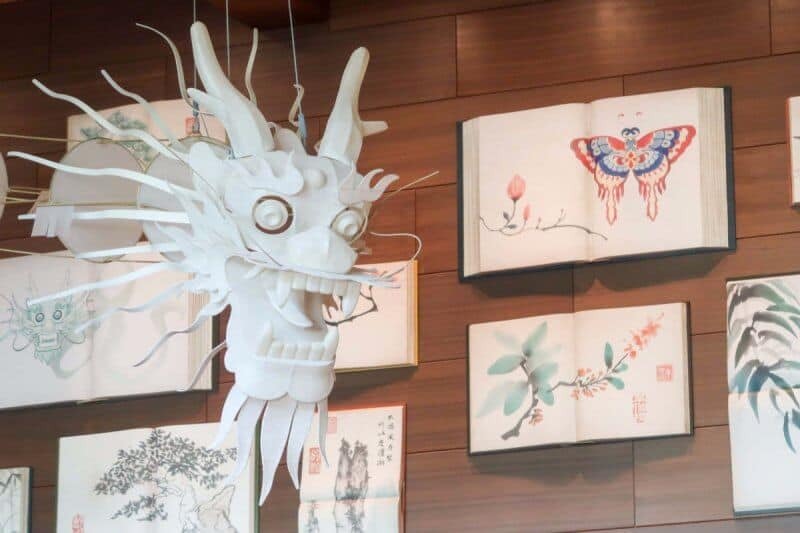 Dragon Wind offers a character breakfast buffet in the morning, a buffet for lunch, and table service in the evenings. 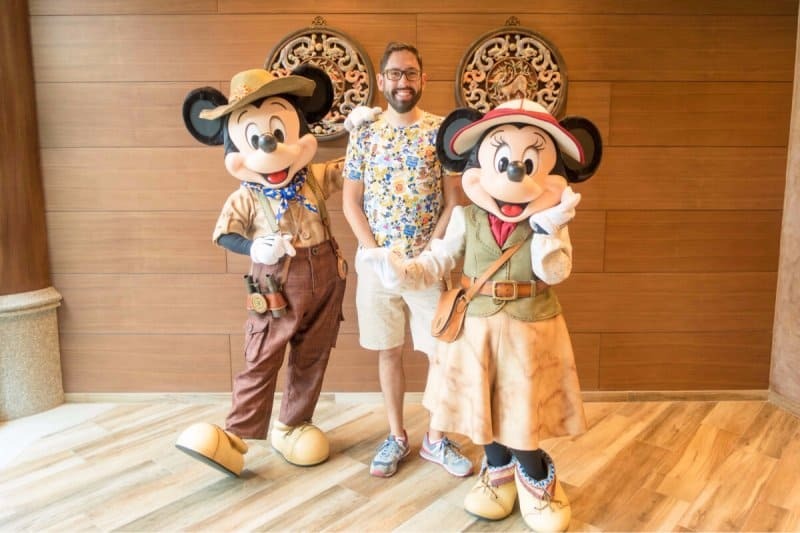 The character breakfast features Mickey and Minnie in their adorable Explorers Outfits. If you’re a collector of character photos, then you know this is a must. I have done the character breakfast 3 times and has never disappointed. 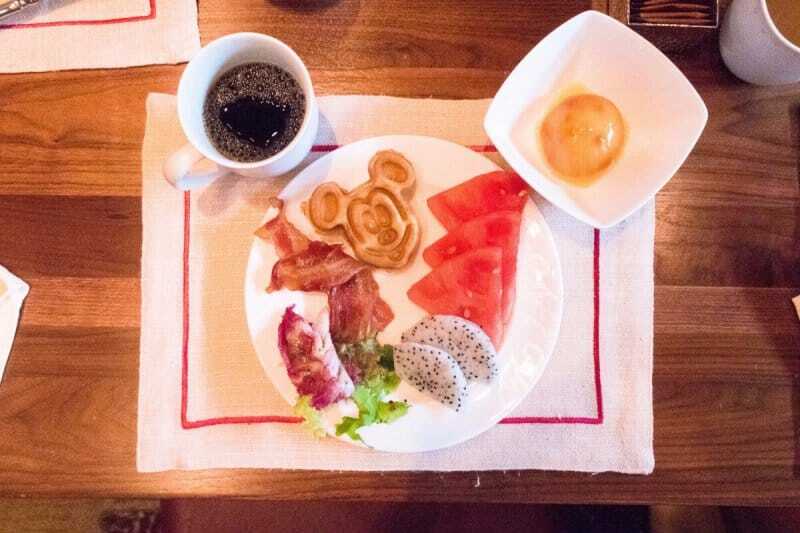 There’s a wide variety of breakfast options from Western (bacon, eggs, Mickey waffles, cereal, etc) to Chinese cuisine. 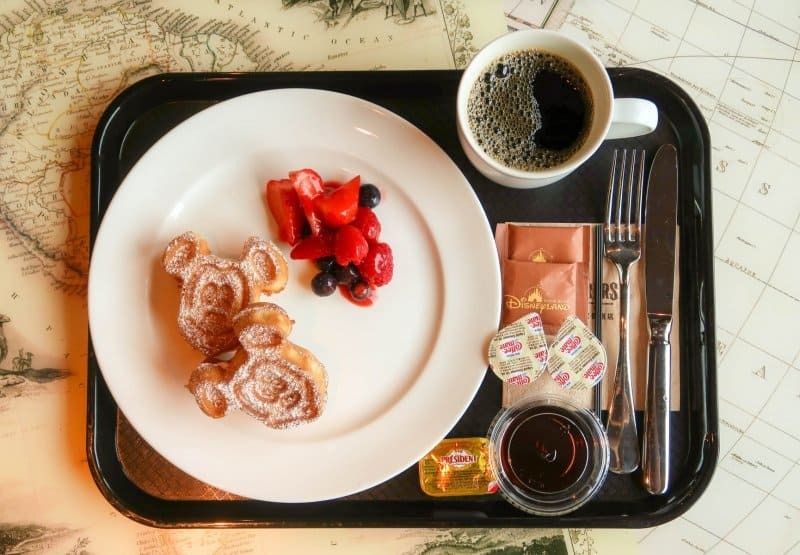 It’s the best place to eat for breakfast at the hotel and is a must. What I love the most (besides the fantastic food and excellent decor) is you’re able to meet Mickey and Minnie at your own pace. You’re given a card and, when you’re ready, head to an area off to the side and meet Mickey and Minnie. I prefer this because at the Enchanted Garden (Hong Kong Disneyland Hotel) the characters come to your table. I prefer to meet the characters once I am finished eating. I find it less stressful that way. For information on how to make reservations and the seating times for the buffet and character dining, check the official website. The entire hotel offers free WiFi (it’s in the park as well) which has good reception in the rooms and lobby. The pool area, gardens, and hallways are spotty or non-existent. If you want constant connection, then I recommend this SIM Card or Pocket WiFi through Klook. 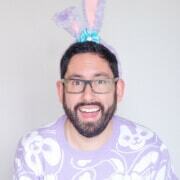 If you bought too much merchandise (it’s easy to do, trust me), then I have fantastic news! You can take the $500 USD worth of Gelatoni, StellaLou, and Tsum Tsum merchandise and have it mailed home (don’t judge me). I sent items from the Hong Kong Disneyland Hotel in the past, so I imagine it’ll work the same way here. They’ll even supply a box for you. Need more Hong Kong Dollars to throw money at the Tsum Tsum Glowing Cotton Candy? Then you’re in luck (again). There’s an ATM that takes a wide range of intentional cards (Visa Plus). We’ve used cards from Canada, Australia, and Japan without any issues. There’s a shuttle bus to take you to and from the park and MTR Disneyland Resort Station. At certain times during the day, there is a dedicated bus just for the Disney Explorers Lodge. 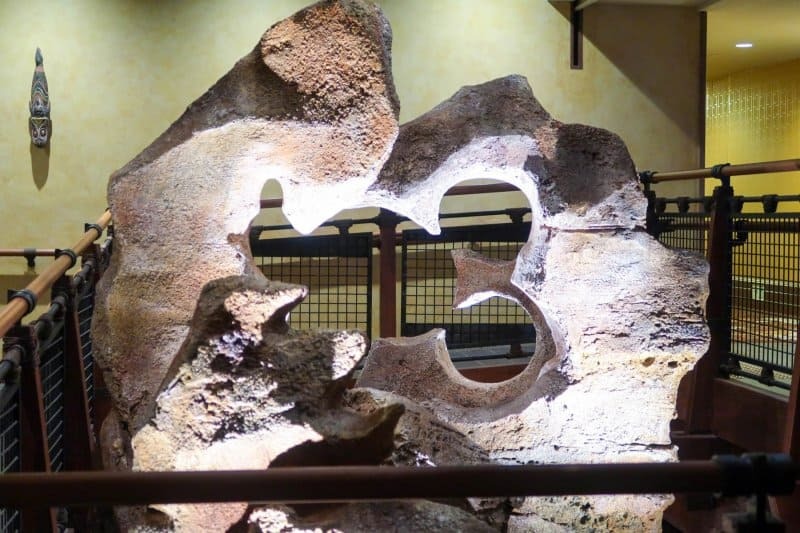 Here’s a list of the good and not so good points of the Disney Explorers Lodge. Easy to get to from the park (all Disney hotels have a free shuttle). Certain times in the day, there’s a dedicated bus just for the Disney Explorers Lodge. If you’re a Magic Access Member (read our guide to see if it’s worth it for you), then you may be able to book this at a bigger discount. I recommend this meal voucher to save on meals inside the park. After making your reservation send an email to arrange a pickup for the shuttle (if you don’t want to take the train or taxi). This costs about $5 USD per person. 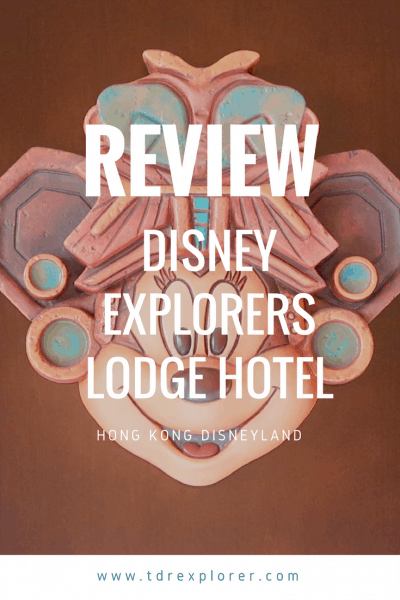 If you’re on the fence as to which Disney hotel to choose, then let me make it easy for you: go with the Disney Explorers Lodge. 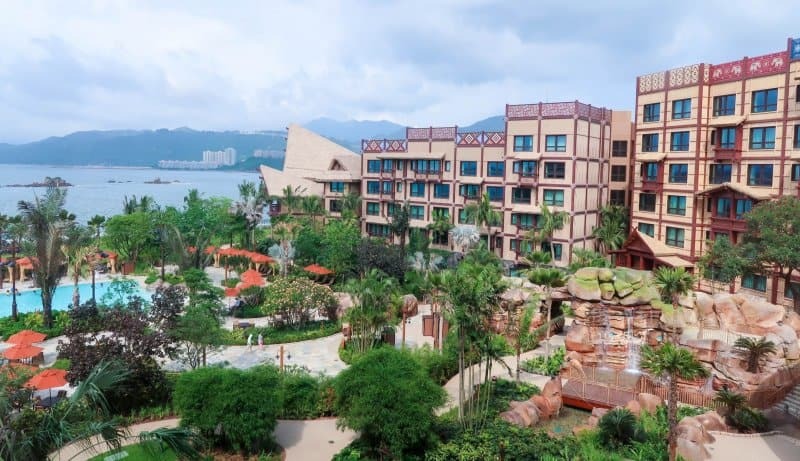 It’s now their best hotel (in my opinion) and the price is in the mid-range (less than the Hong Kong Disneyland Hotel, but more than Disney’s Hollywood Hotel). Their execution of the “Explorers” theme is spot on and gives you that sense of exploration and adventure. 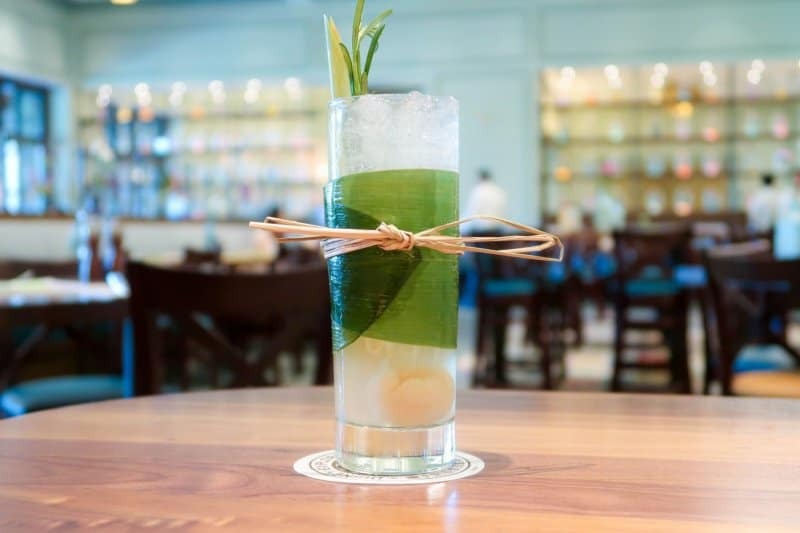 The overall aesthetic radiates relaxation, even when it makes you want to explore and discover all the detail. You can’t go wrong if you make this your choice in hotel. Love the 4 theme gardens to explore so much! Hope to see more characters meet and greet in Disney Explorers Lodge in future. I just made a reservation here for the Marvel Race Weekend in September (we are expats in Shanghai). Thank you so much for all your work on this site — it is amazing! 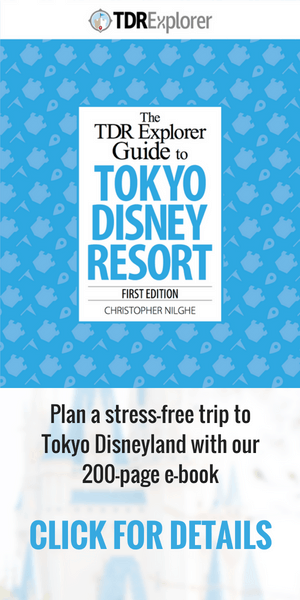 We used it religiously for our trip to Tokyo Disney last winter, and now we’re learning all over again for Hong Kong. Thank you, thank you, thank you!